Disc jockey Carter The Cart-Man Jackson has been climbing the stairway to heavenkeeping his life as simple as possible by living from one song to the next. He had the world by the tail, coming from a family of power, prestige, and politics until he let it all go. Killer Queen is burning up the highway to hellterrorizing a town, in her crimson-red stilettos, by holding random men at gunpoint. Sh… e had nothing, except a dad who abused her and now she has nothing to lose. 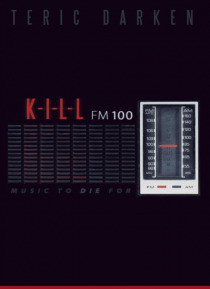 K-I-L-L FM 100 is the visual soundtrack of two opposing lives colliding head-on at a destined radio station. As Killer Queen puts the DJ under the gun during his night shift, she begins to question who the real hostage is, as she confronts the demons of her past. And as the DJ shines his light into her darkened world, a few shadows of his own begin to loom from his closet. When the lane narrows on this solitary stretch of highway, both captor and captive realize that somethings got to give. Someones got to go. Closing in fast on this dead-end drive, two souls discover that their lives are not so different; each has lived under a mask, and each is in dire need of genuine love. A full-throttle storyline, injected with one of the most unique twists ever unleashed, K-I-L-L FM 100 is the thriller that reads like a soundtrack. There's a time for everything under heaven. Killer Queen knows theres a time to kill.